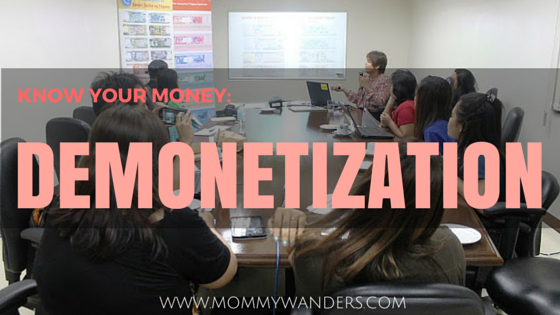 Last July 10th, I was privileged to attend a blogger’s forum on Demonetization Program, which tackles about the Philippine Money. It was a fun and casual talk arranged by the Philippine Information Agency (PIA) Cebu, and the Bangko Sentral ng Pilipinas (BSP) Cebu Region, together with the Cebu Blogging Community (CBC). BSP or the Central Bank of the Philippines is the ONLY AUTHORITY to print money and regulate our bank operations. I learned a lot about the Philippine money, specifically more on Demonetization, New Generation Currency Series, types of money (fit, unfit, & mutilated), and new security features. For this post, I’ll talk about Demonetization, and in another post, I will share the best ways to detect counterfeit money. What is Demonetization and which MONEY will be Demonetized? Demonetization is the process of withdrawing the money from circulation and removing the monetary value of the legal tender currency, by the issuing authority, which is the BSP. Demonetization happens every 30 years and this the 30th year of our old generation banknotes. Currently, we are using two generations of money. The old banknote series or the New Design Series (NDS, launched in 1985), and the new banknote series or the New Generation Currency Series (NGC, launched in 2010). According to BSP, BOTH old and new banknote series CAN BE USED today. However, the old generation banknote series, will be used until December 31, 2015 ONLY and will be under demonetization starting next year, January 2016. What will happen during Demonetization? Since the old banknote series can be used today until December 31, 2015 ONLY, starting January 1, 2016, these old bills can no longer be used in transactions. By January 1, 2016 – December 2016, old banknotes can be exchanged to the new generation currency at ANY bank in the Philippines. On January 1, 2017, old bills will be demonetized. Meaning, they can’t be exchanged or used and they will no longer have monetary value. So by that time, only the new generation currency will be in circulation and be used in all transactions. All banks, including cooperative banks, are authorized banks to exchange your old banknotes. It is OK to exchange at any bank even if you are not a depositor of the said bank. Exchange is FREE of charge. NO maximum amount and NO limit as to the number of exchanges. Exchange is from January 1, 2016 up to the last banking day of 2016. Persons living abroad who are in possession of old banknotes can register online at www.bsp.gov.ph from Oct.1, 2016 – December 31, 2016, to have a one year extension for the exchange period, from the date of registration. BSP and PIA Cebu have been very active in spreading the news on Demonetization. I hope I have done my part in sharing about this important information on our money circulation. Please do your part and share this to your family and friends. Good to know we have the entire 2016 to exchange old banknotes. Noted in my calendar. Will be sure to trade in my old bank notes.